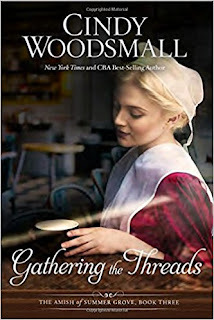 Gathering the Threads is the final and third book from Cindy Woodsmall's series, The Amish of Summer Grove. I was completely surprised how the series ended. There were some twists I did not see coming at all. I have enjoyed the series, but did not enjoy this one as much as the first. I was confused with a few things and felt like the storyline was being rushed. However, as I continue to read it, it all came together in the end. A wonderful ending to a great series.